We’ve put in a lot of work into making your monthly reports easy to create and understand, and we are happy to announce the release of unique Executive Reporting feature for Spatineo Monitor. The Executive Reports show the most important Key Performance Indicators of the quality and usage of your spatial web services. Our new Executive Reports summarize massive amounts of data into one-page comprehensive graphs and can be emailed automatically to you every month. In addition to the new report types, reports in general have been made easier to configure. Report schedules can now be linked to specific groups or all your owned services. 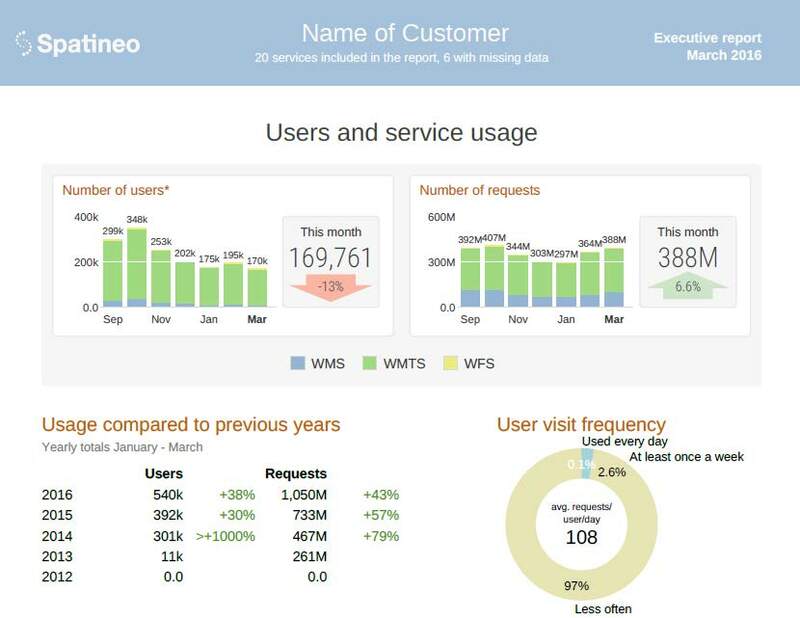 Using groups makes it easy to keep your reports up to date when new services are added to Spatineo Monitor. This report shows the trends in the development of amount of users and usage of your services and helps you focus on the most used data sets and services. Distribution of users and requests across different services (e.g. WMS, WMTS and WFS) is visualized on the graphs and compared to the previous months and years, which allows evaluating your services’ usage at a glance. The report also summarizes most popular and trending data sets while identifying top origins of requests. In that way you can easily understand, how the users find your services and what data they are interested in. 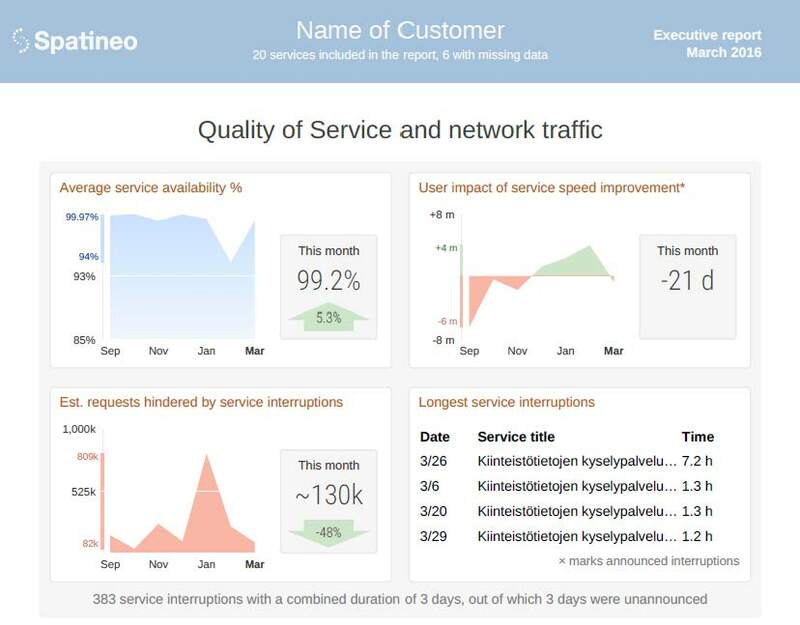 This report gives a concise summary of service availability and speed improvements, allowing for easy evaluation and reporting of your services’ quality. Data visualization makes it simple to identify the trends affecting service level and availability. As a result you are fully informed on not only the technical details but also the impact that changes in quality has on end users. Executive Reports are included with all the other great features of Spatineo Monitor. Try it out for free!